Stacy Horn » Blog Archive » Hurricane Schmurricane? Although this is putting me in danger of writing something that will become famous last words, Irene has already been downgraded to category 1?? Do hurricanes ever whip back up? Or is this it? Maybe I’ll go to the movies. Hey, has anyone read this article about Joe Hill? Bottom line, I can’t buy that neither Joe Hill, his girlfriend, or the doctor who treated him, wouldn’t come forward to explain his gun shot wound. Protecting his girlfriend’s privacy doesn’t seem like a compelling reason. She wasn’t a married woman. Becoming a martyr for the cause? I just don’t see that either. I don’t see his girlfriend keeping quiet for that. It just doesn’t make sense. 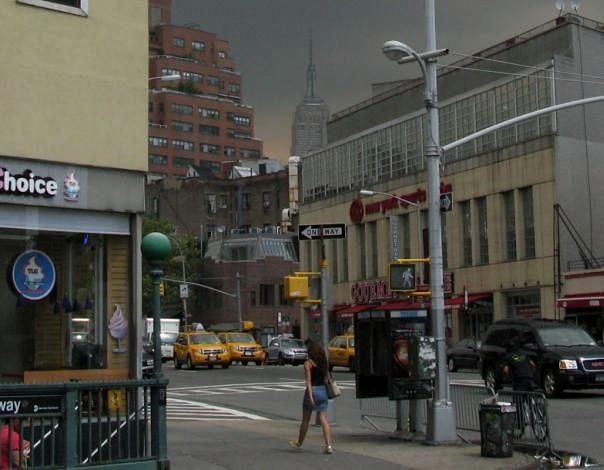 An approaching storm, except not Irene, I took this yesterday, on my way to empty store after empty store.